At Masonry Technology Inc., we recognize the challenges we collectively face in protecting and improving the world we share. Environmental consciousness creates a better world for us all to share. At MTI, environmental consciousness creates a quality product as well. That's how we do business. Recycled Content - MTI's rainscreen drainage plane systems are made from a minimum of 96% post-industrial recycled material - the highest recycled content of any rainscreen drainage plane product on the market! Our black plastic products are 100% recycled content. Recyclable - MTI’s drainage plane & weep products can simply be recycled. Minimal manufacturing waste - MTI’s advanced manufacturing process has a material yield percentage of over 99.8%, minimizing costs for our customers. 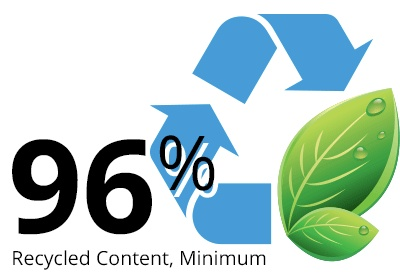 What’s more, we recycle the minimal 0.2% manufacturing waste, keeping it out of the landfill. Lower environmental impact means designing and constructing buildings that will last. MTI's systems-based approach to moisture management recognizes that wall assemblies perform well when the components work together. Our rainscreens, weeps, and basement moisture management products are designed to keep your walls dry, strong, and in-service for the long-haul.